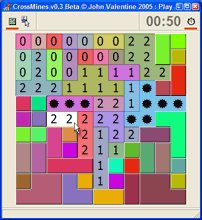 If you have played Minesweeper (provided with Microsoft Windows), you will know the standard game. 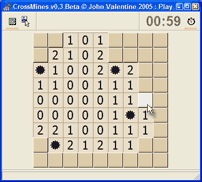 Crossmines also has variations on this game, which provide lasting appeal. This option creates a game where cells are larger than a single square. The example here shows a highlighted cell marked with '2'. One mine is already located (the purple cell above it), so this means that any of the five unrevealed adjacent cells could contain the other mine. In the New Game box, you can move the 'Shaped Cells' slider to choose how large the shaped cells are in your game. This option links non-adjacent cells, so they act as one cell. In this example, a cell is highlighted under the pointer. 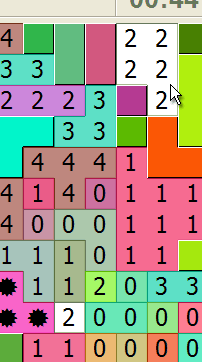 It shows '2' adjacent mines. However, the cell is linked to the highlighted '2' at the bottom of the screenshot, so the mines could be located around either of the two cells. There is already one mine next to the bottom cell, so the remainiing mine could be any one of the unrevealed cells surrounding the cell under the pointer. In the New Game box, you can move the 'Linked Cells' slider to choose how much linking happens in your game.